Send a Postcard to Curiosity! The top science priority for this plan is to acquire all of the data needed to adequately characterize the rocks at the current location before driving away. So the GEO Science Theme Group discussed the priorities of various proposed observations, including a Right Mastcam mosaic of the arm workspace and surrounding area, ChemCam LIBS targets, and a mosaic of the mid-field terrain toward the south. Fortunately, power modeling indicated that the pre-drive science block could be lengthened to 2 hours, which made it much easier to fit all of the desired observations into the plan. First, ChemCam will measure the elemental chemistry of 4 nearby rock targets, called "Ledmore 2," "Minginish," "Askival 3," and "Tyndrum 3." Minginish has already been examined by MAHLI and APXS. Then the Right Mastcam will take images of Askival 3 and Ledmore 2, as well as a 9x1 mosaic of "Lorne Plateau" (the area to the south), a large mosaic to provide complete coverage of the area in front of the rover, named "Bressay," and a 3x3 mosaic of the "Jedburgh" area closer the rover toward the south. All these data will give the science team plenty to think about as we try to better understand the variety of rocks at Bressay. We are transitioning into restricted planning again, so the drive away from Bressay is planned on Sol 2020. The drive target is a conglomerate rock named "Waternish." After the drive, early on Sol 2021, Mastcam will measure the amount of dust in the atmosphere and Navcam will search for clouds. Later that sol, Navcam will search for dust devils and Mastcam will measure dust opacity again. Then ChemCam will acquire calibration data and will use AEGIS to autonomously select and acquire LIBS data on a target in the new arm workspace. Finally, MARDI will take an image of the ground under the rover during twilight, to sample the terrain once again. Overall, it was a good day for me as SOWG Chair, and despite the late start we finished planning in time for me to take my wife out on her birthday this evening! These blog updates are provided by self-selected Mars Science Laboratory mission team members who love to share what Curiosity is doing with the public. Dates of planned rover activities described in these reports are subject to change due to a variety of factors related to the Martian environment, communication relays and rover status. Planetary Geologist; The Open University; Milton Keynes, U.K.
Sol 2383 - 2385: Drill all the rocks! Yestersol's drill pre-load test was successful, so today we are go for a drill attempt at "Kilmarie!" Some days just give me goose bumps. First, looking at yesterday's plan I realized that we did something really unusual overnight: Wrap up the drill activity on one site and start the drill activities on the next in the same sol. Curiosity is finishing up at "Aberlady" and ready to move on to our next drill target. We are preparing to drill a second hole in the clay bearing unit. Yesterday's discussions with the science team focused on determining which target in the vicinity of "Aberlady" will become the focus of the next drill campaign: target 2, or target 3 (pictured in the Sol 2379 Mission Update). With our time at Aberlady coming to a close, the search for our next drill target is in full swing. On Friday, the team discussed two different "bump" options that are near our current workspace and may be drillable. We are continuing the sequence of drill activities at Aberlady. Today we received the initial results from CheMin's analysis of the "Aberlady" drill sample, and they look great! This week's drill activities have been very power-intensive for Curiosity. So we'll spend today, Sol 2374, catching up on some remote science observations while waiting for data from yesterday's CheMin run to arrive. Sol 2373: To sample or not to sample? That is the question. After looking at our exciting new drill hole, "Aberlady," a few interesting observations were made: the drilled block lifted up a centimeter or two as the drill was retracted, there might be some evidence of a horizontal calcium sulfate (i.e. gypsum) vein within the drill hole, the drill went into the rock very easily (no percussion required), and the drill tailings look clumpier than usual. Sol 2372: Drill Success at Aberlady! Our drill attempt at target "Aberlady" this weekend was a success! In today's plan we are continuing our investigation of Aberlady and the surrounding areas and preparing to deliver our drilled sample to our onboard instruments. We are go for full drill! Today's plan will see Curiosity execute the final preparatory steps and then drill at our "Aberlady" bedrock target. Sol 2368: Let the Drilling Proceed! Today marks the conclusion of the MSL Science Team Meeting currently taking place at Goddard Space Flight Center in Greenbelt, MD. Our short drive on Monday was successful, bringing two candidate drill targets into closer, clearer view. Sols 2365-2366: Edging closer and closer to a new drill target! One of the primary goals of the Curiosity mission, to determine the composition of a region which appears to be rich in clays (informally known as "Glen Torridon") is getting closer to being achieved. Sols 2363-2364: Drilling on the horizon? Curiosity is getting close to the area in which we next want to drill. We are possibly as close as 2-3 drives (including today's) away from our next drill target! We are continuing to find interesting new things in Glen Torridon. One of my favorite new images was taken this weekend (Mars sol 2356) on target "Stonebriggs." At the start of Sol 2359, Curiosity found herself parked in front of some layered bedrock outcrops, a rarity in the rubbly landscapes that we've explored so far in the clay-bearing unit. Sol 2354-2358: Clay-bearing unit showing us its stripes? As Curiosity makes her way to the site where the science team would like to drill next, there is no shortage of observations to make of the many different lithologies of the clay-bearing unit. Sols 2352-2353: Why are we cracking up? Today was a fun, busy day to plan. 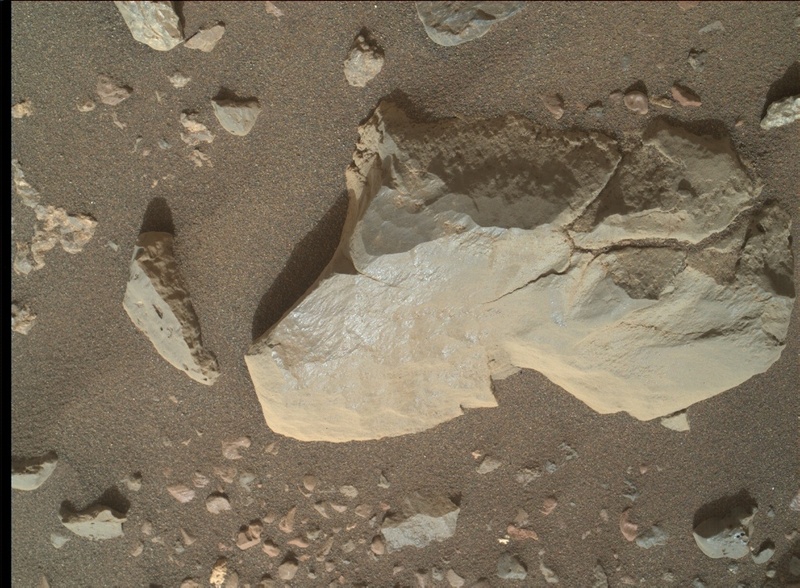 Curiosity finally made the drive to a rock called "Muir of Ord," which has a cracked surface. The Curiosity Operations team planned a 3-sol plan today, with lots of activities for both the Environmental (ENV) and Geology (GEO) theme groups. Curiosity is back to work after another hiatus due to a computer reset. Sol 2340: And objects in the rear-view mirror may appear… interesting! In the current plan, we start with a dust devil survey to look for them while they are still in season. This is followed by a ChemCam investigation "Schiehallion" and an RMI mosaic on "Motherwell." Mastcam will finish off the investigation with multispectral images on the block in front of us, which contain the previous APXS targets "Fife" and "Arbuthnott." So far, so routine, but then there was the look in the rear-view mirror! Today we planned Sol 2338 chock full of science activities to finish up our observations at the "Midland Valley" outcrop. We'll primarily use our Mastcam and ChemCam instruments to take a closer look at some interesting rock targets in our workspace. Curiosity returned to science planning today after a two week hiatus because of a technical issue. Our most recent science plan, described in the blog for Sols 2320-2323, included a drive towards a blocky outcrop called "Midland Valley." Today was a very busy planning day for the Curiosity operations team. We planned a 3-sol plan, with contact science, imaging, environmental monitoring and a drive. Similar to its namesake in Scotland, the Glen Torridon area on Mars affords us stunning vistas, but in our case, of the relatively low-lying clay bearing (from orbit) unit flanked to the north by the higher ground of the Vera Rubin Ridge and to the south, by Mount Sharp. Curiosity is driving across the clay-bearing unit, which is still a very new terrain with many details yet to be understood. Curiosity is cruising through the clay-bearing unit on some compacted clast-rich soil. The accompanying image shows the target "Brent" in the lower right corner; it was analyzed with ChemCam and APXS, and imaged with MAHLI over the weekend. Curiosity successfully completed her drive yesterday and is currently parked on top of one of the ridges ("Knockfarril Hill") in the clay-bearing unit. In today's plan, Curiosity is venturing further into the clay unit territory. Today's plan found Curiosity solidly in new territory and the view couldn't be more different than the patchy bedrock of the Vera Rubin Ridge. This weekend's plan started off on Sol 2301 with some Mastcam atmospheric observations, followed by ChemCam analysis of "Loch Ness" and "Loch Skeen," examples of brown and gray bedrock. Sol 2300: Beam me up Scotty! Curiosity is on the brink of descending down off the Vera Rubin Ridge (VRR) onto the clay-bearing unit. Curiosity is continuing the first phase of its journey to the "clay-bearing unit," the low elevation portion in the middle distance of this Navcam image with a series of "touch-and-go" driving sols. Curiosity has moved for the first time since December 13, 2018. More importantly, Curiosity is moving to a new geological unit that we have so far called the "Clay-Bearing Unit". Sometimes the best laid plans of rovers go astray. After wrapping up at the Rock Hall drill site yesterday, the plan was for Curiosity to start driving towards the clay-bearing unit, starting with a series of small bumps so that MAHLI could take images of the full outer circumference of the wheels. It has been a productive stay at the "Rock Hall" drill site. Today was our last day at "Rock Hall," so it was our final chance to get every last bit of science at this location. We had a 2.5 hour science block filled with Mastcam change detection imaging of the Rock Hall drill fines and alternating ChemCam RMI and LIBS observations of the Rock Hall dump pile, drill tailings, and target "St.Cyrus 2." Sol 2291: Selfie time at Rock Hall: say cheese! Today we planned a single sol of activities, Sol 2291. As we begin to wrap up our activities at the Rock Hall drill site, Sol 2291 is chock full of science observations. We'll begin the sol with an hour-long science block. Sol 2288-2290: Drilling activity completed, almost. We will soon be leaving the Rock Hall area, thus this one last look at the drill site from a hazard camera perspective. Seeing those holes always is special, even for #19! Our onboard instruments SAM (Sample Analysis at Mars) and CheMin (Chemistry and Mineralogy) have come to the end of their investigation of the Rock Hall target, likely to be our last drill location on the Vera Rubin Ridge, so this 2-sol plan is the beginning of the drill operation wrap up. Today was a very smooth planning day on Mars, with the first scheduled science block in the plan being entirely filled by various spectroscopic ChemCam observations. The ChemCam instrument has the capabilities to be used in both passive and active modes, both of which were included in today's plan. Sols 2281-2283: It's a wonderful day for SAM! Today we are continuing the drill campaign at our red Jura target "Rock Hall." The focus of this weekend's plan is the dropoff of the Rock Hall sample to the SAM instrument, which will occur on Sol 2281. Sols 2279-2280: Happy 2019, Earthlings! The holiday planning completed successfully and included 10 sols of five-hour-long morning meteorological observations by REMS, during the period when more complex activities were precluded.